"I'll have you know that I am a lady of many talents~! ♥." 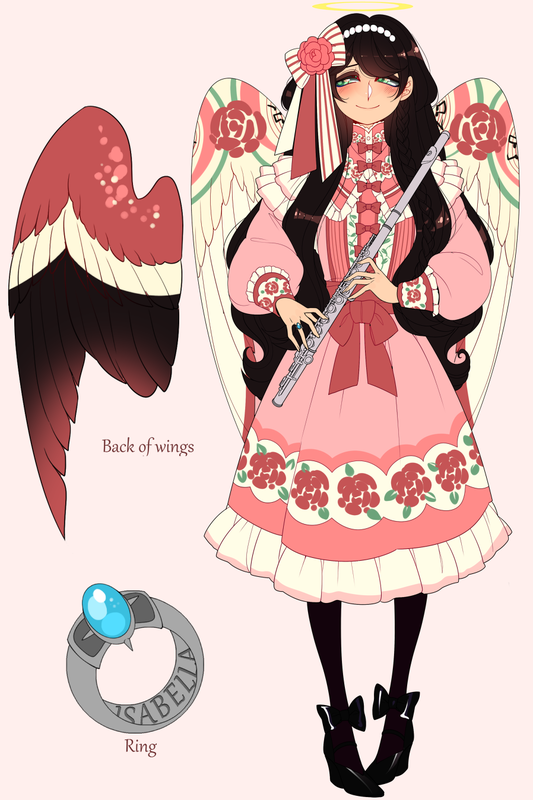 A musical angel who's specialty happens to be the flute. 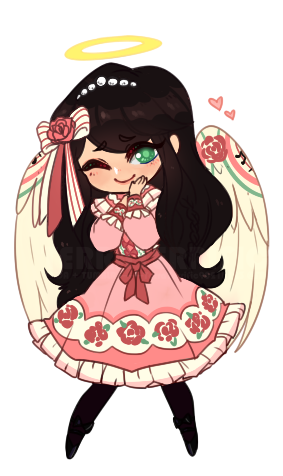 Known by most as the child actress from the broadway-esque musical BELLA that was extremely popular at one time, Isabella entered the Angel of Music Tournament without hesitation. Despite the fact that female angel hasn't won the Angel of Music title since the rise of Lucifer millions of years ago. Aside from music, she's also very talented in the art of dance. 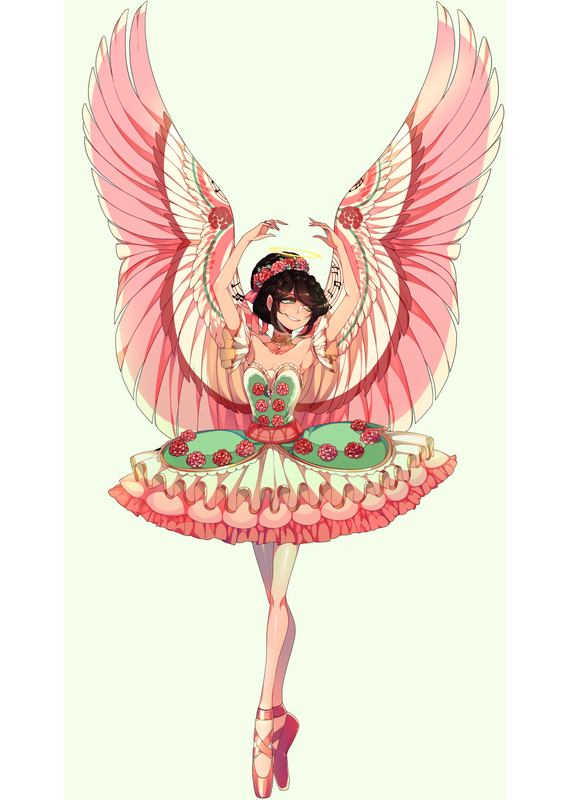 She's currently competing in the Angel of Dance Tournament where she's managed to stay in the upper rankings along with a few of her friends. Her concentration is in ballet. Isabella is a very sweet girl and her musical prowess is nothing to take lightly. However, she's going to have to work ten times as hard as everyone else if she wants to succeed. Isabella is a girl who's very open and gives off an inviting aura that makes her easily approachable. People actually tend to flock to her. She treats every person with as much kindness and affection as the last which makes it difficult for those with strong feelings for her to know exactly where they stand. She's bubbly and is just about always smiling, even when she has a reason not to. She's a dreamer, a type of girl who enjoys fantasizing about knights, princesses, white horses, and castles. She can be a bit air-headed at times, not to mention bratty, but she's well versed in etiquette and fits Heaven's idea of a proper young girl. But best believe that if someone or something she cares deeply about is mistreated in any way, she'll drop everything she's been taught about being "proper". 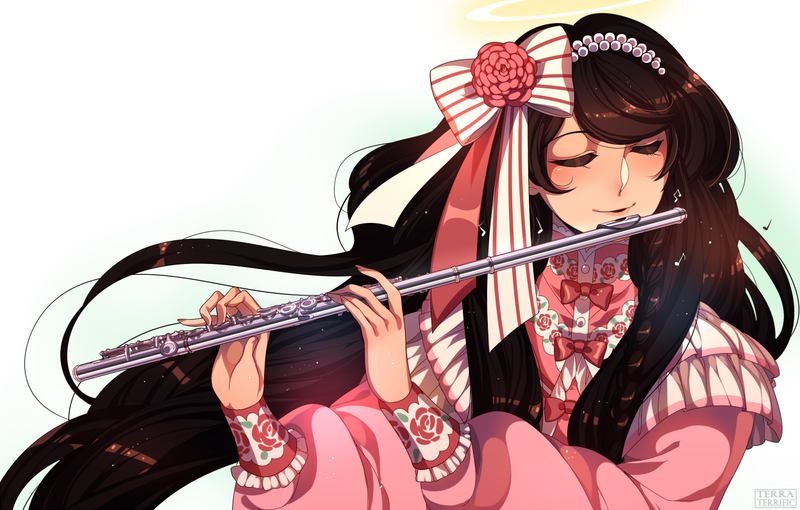 Nature: Her favorite place to practice the flute is in the forest where it's quiet and open. Books: She likes to read love stories and fairytales. But, she rarely has time for that kind of thing nowadays. Dancing and Music: She took an interest in the subjects at a very early age. She can't decide which one she likes more. Tea Shops: She enjoys tea itself but she also enjoys the inviting atmospheres that Heavenly tea shops always have. If she's not somewhere practicing she's probably at a tea shop somewhere. Cats: They're her favorite animal. Bunnies are a close 2nd. Negativity: She prefers to be optimistic. She feels that bad situations speak for themselves and need no added attention. Harsh Criticism: She understands that criticism is necessary to improve, but she always feels that some judges in both the dance and music competitions go too far with their words. Demanding People: She embraces the idea of independence. She doesn't like when people try to force their wishes on her. Pompous People: She's off-put by people who brag continuously. 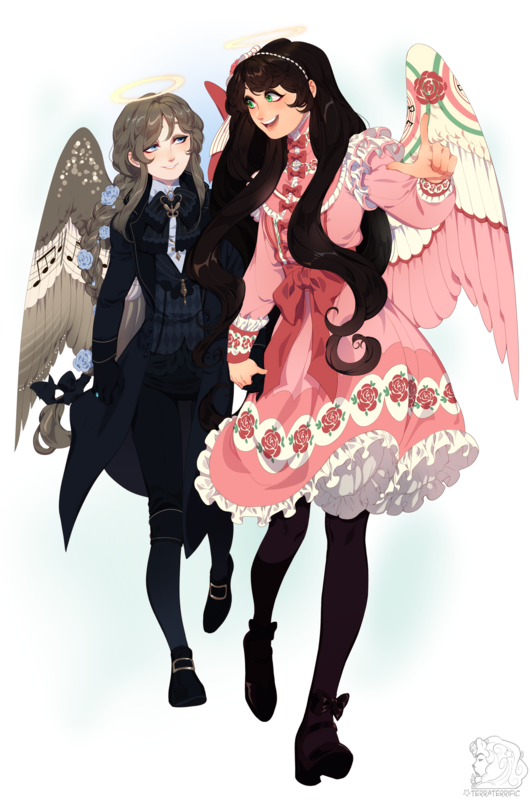 Isabella and Sophronia have been friends since they were small. She's like a sister to her. Their (god)parents were good friends so they had plenty of time to interact with one another. When Isabella started doing shows they drifted apart for a while, but they've since gotten back to being close. Isabella met Azarael at the music tournament preliminaries. She really enjoyed seeing him perform. When Celestino introduced him, he was really quiet at first. She started to wonder if he disliked her, but he eventually warmed up to her. His down to earth attitude was refreshing and they had a lot of common interests. They've become really good friends since their first exchanges. Priscilla is another person Isabella has known since she was smaller. They went to the same private Sunday School. Priscilla's always been a bit of a crybaby, but she's always there if Isabella wants to hang out. She can also trust her not to tell a secret...for the most part. Isabella initially met Birdie at the beginning of the dance competitions. She was horribly intimidated by her at first but after learning that she and Sophronia were close friends, she gathered up enough courage to approach her. They've been good friends ever since. Isabella has known Celestino for quite some time. When his music career was just starting to kick off, they did a duet together that was really successful. People have been shipping the two of them together ever since, but she just doesn't see him that way. He's a little too...over the top. Esperanza is another person Isabella met at the beginning of the dance competitions. Unlike Birdie who just looked aloof and intimidating, Esperanza when out of her way to make sure that Isabella knew she thought she was better than her. Rather than get offended, Isabella decided to try killing her with kindness. It's been working pretty well. Calling Devereux an acquaintance is a bit of a stretch since he never says more than two words to Isabella. (None of which have been nice) Still, she's very curious about him and always tries to talk to him when she gets a chance. He's a really good pianist and Isabella loves to listen to him play. He provides the music for the ballet dancers during practice on certain days of the week and she also sees him at the music competitions sometimes. He's so quiet and mysterious. She may have just developed a little crush on him. A young angelic violinist whose dream had always been to become an Angel of Music was faced with a continuing struggle to improve. Having advanced enough to reach the intermediate level, Azarael just couldn’t manage to breach the advanced-level threshold. But, just when he was at the point of giving up, he was greeted by an anonymous spirit who promised to help him get to that next level. Without truly understanding the spirit’s motives Azarael follows him blindly and begins to progress once again. The story follows Azarael as he works to climb to the top of the charts in the Angel of Music Tournament and offers some insight on exactly what it takes to make it in Heavenly society. Q: When did you realize that you wanted a career in music? “Singing and dancing is basically my life. I mean....[laughs]. this...colonist? It was a jokey historical bit, but I had the white hair and this little flute, a fife, and I had to sing and do this little march? I had no idea how to play an instrument at that time, but my dad made me practice until I had the song down. I had this Yankee Doodle thing going on and it was so goofy but so much fun! 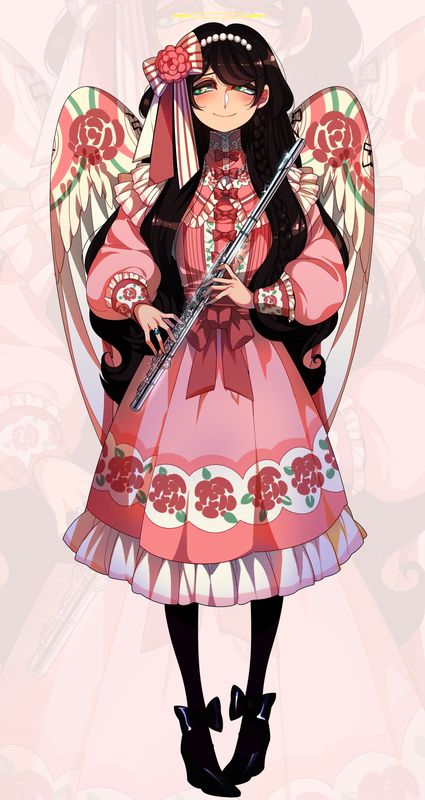 So when I decided to enter the music tournament I was like YEP, TOTALLY GONNA PLAY THE FLUTE. NOT A FIFE. THE BIG ONE. I didn't realize how different the two of them were, though. ;;"
“Oh golly...I don't even know. I'm inspired by so many different angels. I can't pick just one and I feel like if I try to name them all I'll leave someone out, and then they'll see this and feel bad." “I love pop! Classical is nice too. Also, heavy metal is pretty neat....but don't tell anyone I said that." Q: Do you believe that angels with certain skills should have to compete for their titles? I mean I know why they have to do it that way. I just don't think it's fair that some angels have to compete while others don't? Q: What’s your favorite thing about the Angel of Music Tournament? Q: What’s your least favorite thing about the Angel of Music Tournament? “I really don't like how rude the judges are sometimes. I mean.... you could tell a person that their playing was bad without being a total jerk." Q: What advice would you give to someone who’s younger than you and planning to enter the tournament when they’re older? “Do your best and have fun!